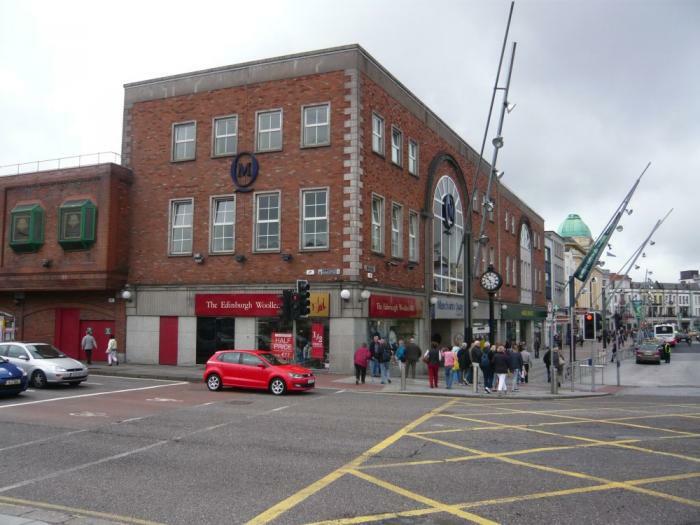 Cork city’s Merchants Quay Shopping Centre is to be offered for sale with planning approval for the redevelopment of a number of its internal retail units. Joint agents CBRE and Savills expect to secure more than €12.5m for the 27-year-old centre which will show a net initial yield of 11.25% before the next owners embark on the reconfiguration of the retail space at ground and first floor levels. When implemented the changed layout is expected to boost the rent roll which now stands at €1.47m a year. Much of the success of the centre on the northern side of an extremely busy Patrick Street stems from the successful trading of anchor tenants Marks & Spencer, Dunnes Stores, Debenhams and Supervalu which hold long leasehold interests. Otherwise there are 29 main shops at ground and first levels occupying just over 4,072 sq.m (43,830 sq.ft). The traders include Laura Ashley which is paying a rent of €292,000, Boots (€193,000), Costa Coffee (€130,000) and The Pantry (€68,000). Owner Atrium Nominees secured planning permission in July 2015 to convert the ground floor circulation space into four large shops ranging in size from 53 sq.m to 338 sq.m (570 sq.ft to 3,638 sq.ft). The rearrangement will involve the repositioning of the entrance to a more central location adjoining Marks & Spencer. It is also planned to convert the circulation space at first floor level into general retail use, amalgamating it with existing shops and creating another sub-anchor unit extending to about 1,575 sq.m (16,962 sq.ft). Merchants Quay is also to get an external facelift with plans to change the three-storey corner at Merchants Quay and Patrick Street from brick cladding to new glazing. The joint agents expect the sale to attract interest from a number of big name investors including Davidson Kempner, Goldman Sachs and Oaktree which have acquired a string of shopping centres and retail parks since 2013. Other prospective buyers might include York Capital, Davy, Clarendon and Värde. Cork’s Patrick Street has attracted a number of leading traders in the past year including Holland & Barrett, SuperDry, Pandora, Vision Express, Skechers and Specsavers. The ongoing development of The Capitol retail centre will also provide an additional 5,000 sq.m (53,820 sq.ft) of retail space which is already under negotiation and is due to be completed by early next year.